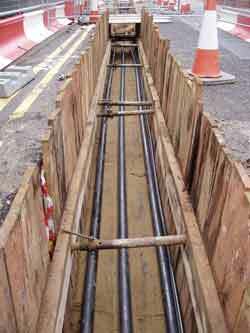 The high-voltage underground cables used on the National Grid system can be one of three types: direct buried, trough, or tunnel. See here for the magnetic fields produced by underground cables and specifically the fields produced by these three different types. On this page, we give more information about these types. The three conductors are buried in a trench in the ground, sometimes with cooling pipes as well. The picture on the left shows a direct buried cable being installed. Once the work is finished, the ground is reinstated and there is no visible sign of the cable along most of its length. The diagram on the right shows typical dimensions. Obtaining a higher rating with an underground cable can involve installing multiple groups of conductors - see how this affects the magnetic field. The three conductors are closer together and contained in a concrete trough flush with the ground surface. These are used in places in London along canal towpaths and elsewhere as well. The picture on the left shows the trough covers of a trough installation near Oxford and the diagram on the right gives typical dimensions. 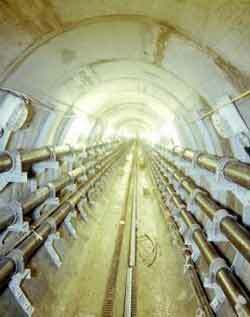 Cables can be placed in a tunnel bored for the purpose deep beneath the ground. This has always been a way of getting cables under rivers but is being used more and more in urban areas as well. Various designs have been used, with the conductors often bundled together, but the photo and diagram show the arrangement typically used for new tunnels. 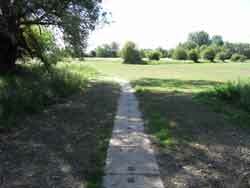 The fields are low because of the greater depth - often below background levels. Gas Insulated Lines (GIL) are a newer technology, not yet used in the UK. See details of what this design looks like and the magnetic fields it produces.